China is the largest economy in the world. Measured in US dollars, the American economy is still number one, with China appearing somewhat behind. But if one standardises the measure of economic output to ‘purchasing power parity’, under which the value of a basket of goods is the same across all countries, China has led the world since 2014. 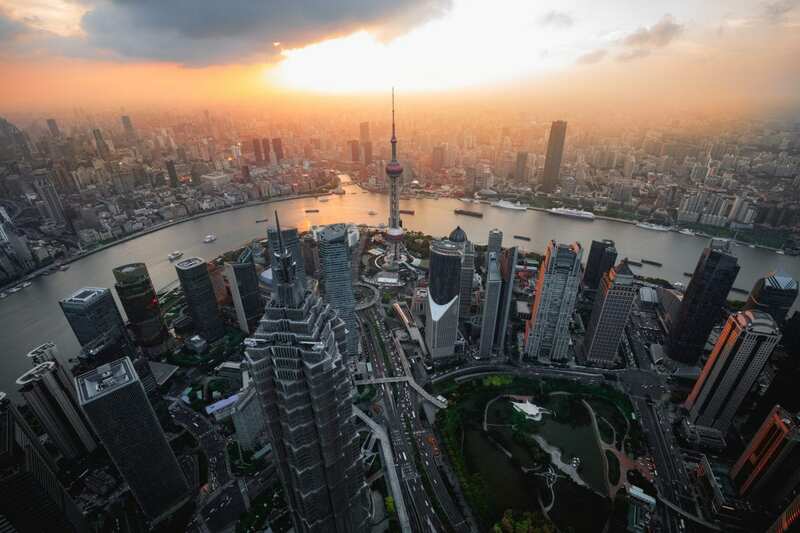 According to forecasts and data from the World Bank, China is expected to account for almost 20% of global economic activity this year, up from 7% at the turn of the century. So what happens in China matters, and in the UK we have seen some of the consequences of a widely reported slowdown in Chinese economic activity, including the decision of Jaguar Land Rover (JLR) to cut the number of people it employs in the country. JLR posted a £3.4bn quarterly loss in Q4 2018 partly on the back of a collapse in sales to Chinese buyers. In recent weeks, the Bank of England has predicted that a 3% drop in Chinese GDP would knock 1% off global activity, including half a per cent off each of UK, US and euro area GDP. We would argue that the impact of a China slowdown on Europe – and particularly Germany – is likely to be greater than other regions. The table below, for example, shows the change in exports to China for key Eurozone nation states, including Germany, Italy, France and Spain. All of these states have increased their exposure to China but Germany’s situation stands out. Since the mid-2000s, the German economy has hitched its wagon to the economy of China, growing its exports to the country by over $70bn per year. It is no surprise, therefore, that with the release of the latest industrial figures from the euro area last week that it was Germany that underperformed the regional average. The flash Purchasing Managers’ Index for Eurozone manufacturers hit its lowest level for almost six years in February, suggesting that industrial output is now contracting for the first time since 2013. The PMI for manufacturers hit 49.2 in February — below the crucial 50 level that separates an expansion in activity from a contraction and down from 50.5 the previous month. For Germany, the figures were worse. The German PMI fell to 47.6 in February, indicating significant contraction. Meanwhile, new orders posted the steepest fall for six and a half years, with a drop in exports to China largely to blame. Some indications out of China corroborate a general sense of slowdown. In December, according to China’s Customs General Administration, exports fell by 4.4% annualised but imports fell even faster, by 7.6%. The January figures reveal only a modest rebound in exports. China is also likely to be accountable for the significant drop in the Baltic Dry Exchange Index, which measures the stock of goods shipped along global trading routes, many of which flow through the South China Sea. The index (Figure 3) had fallen by a third between August and December last year. Ominously, since January, the index has dropped by a further 50%. 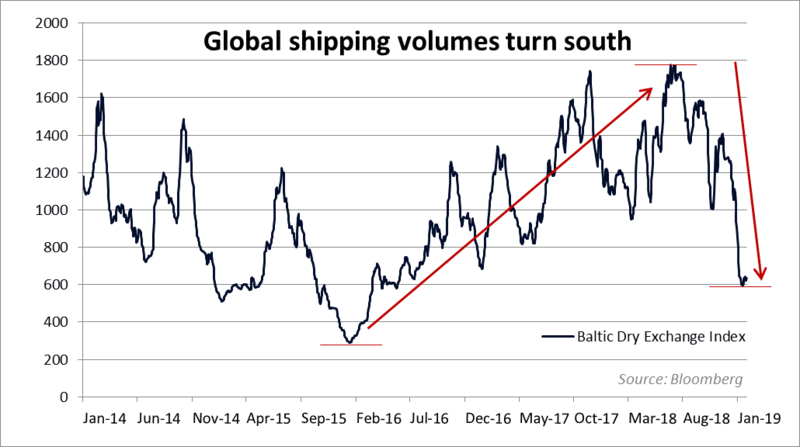 While the index is volatile and has a strong seasonal component, the size of the move in its value in recent months suggests the upward trend in global shipping since the start of 2016 could be coming to an end. Figure 3. The Baltic Dry Exchange Index. This measures volumes of goods transported by ship along key global sea lanes such as the Gibraltar/Hamburg transatlantic round and the Skaw-Gibraltar-Far East route. It is hard to measure clearly what state the Chinese economy itself is in. Official measures of GDP lack the volatility observers expect to see. Many believe that they are massaged by authorities who want to convey the impression of an economy that is managing a soft landing to sustainable, long-term growth. According to the latest GDP figures, the Chinese economy is growing at close to the government’s target of 6.5%. Meanwhile, according to the National Bureau of Statistics in China, spare capacity at Chinese industrial plants rose from 22% at the beginning of 2018 to 24% in January, suggesting lower demand and a squeeze on companies’ profit margins. It was no surprise that China’s Shanghai Stock Exchange was one of the worst performers in 2018. Taking a deep dive, however, shows a slightly mixed picture. 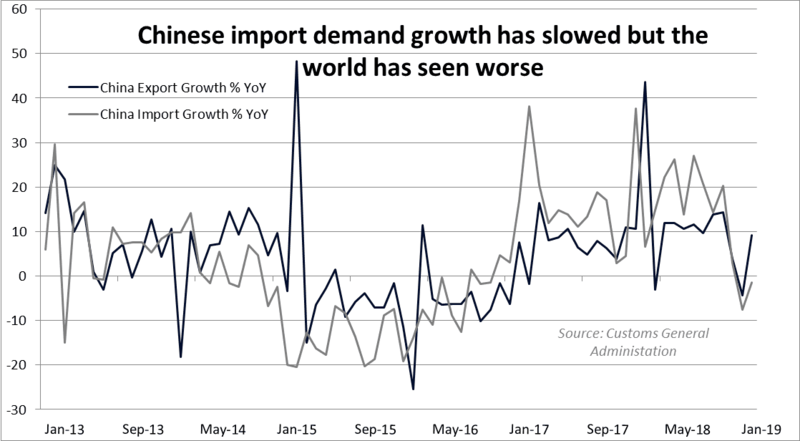 While we noted a drop in trade volumes at the tail end of 2018, Figure 2 also shows that the situation was much worse during 2015 when there were last concerns of a China-led global slowdown. The charts below show different measures of the state of China’s economy. Figure 4 illustrates the Li Keqiang index of electricity consumption and volumes of rail freight and bank lending. That index started to slide in 2018, but it too saw darker days during 2015. Measures of real estate prices are typically a good leading indicator of consumer demand. Monthly house price growth has fallen significantly in the last few months, according to the National Bureau of Statistics in China, leading many to conclude that Chinese spending is suppressed. However, average annual house price growth for new properties across 70 cities had accelerated from 5% growth in early 2018 on a year-on-year basis to 10% most recently. The lagged effect of higher household wealth could feed through into higher consumer demand that also has the effect of boosting imports of consumer goods from the rest of the world. Figure 4. The Li Keqiang Index, an alternative measure of the country’s economic growth based on electricity consumption, railway freight and bank lending. In financial markets, however, there are signs of investor sentiment turning bearish. 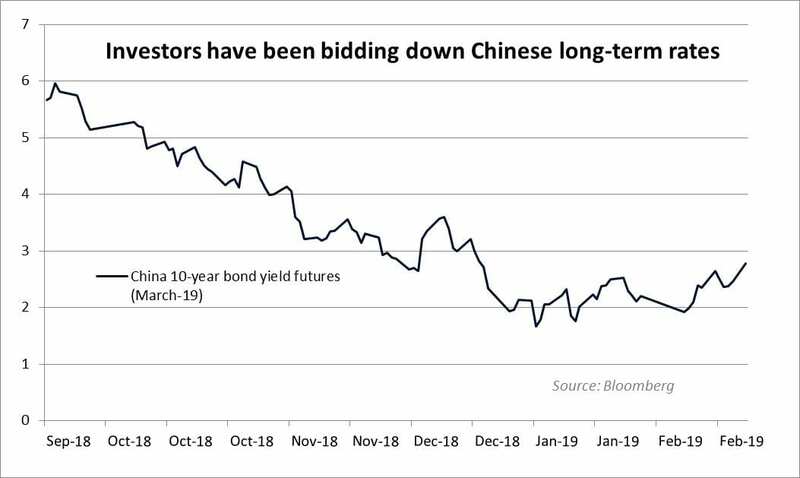 Figure 5 shows that expectations of the 10-year yield on Chinese bonds for March 2019 have significantly fallen since last autumn, implying that investors may be betting on looser monetary policy this year. Figure 5. The 10-year yield future for March 2019 shows the rate that investors expect the actual yield will be in March 2019. It indicates investors’ expectations of future monetary policy and long-term interest rate developments. 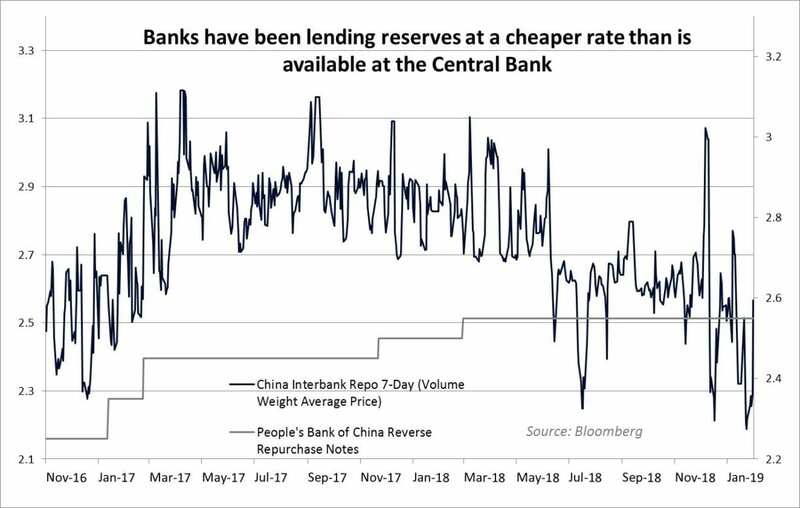 In the interbank lending market, banks have been accepting interest rates for central bank reserves that are below the 7-day reverse repo rate from the People’s Bank of China, as Figure 6 shows. Figure 6. The rate on the PBoC’s Reverse Repurchase Notes (grey line) is the rate at which banks can borrow reserves from the central bank. The Interbank Repo 7-Day rate is the rate that private-sector banks charge each other for central bank reserves. Lower interbank rates may suggest that the PBoC’s decision to reduce reserve requirements (RRR) by 250 basis points for banks in 2018 may simply have led to excess reserves flooding the interbank market, an indication of limited real-economy lending. Or it could imply that banks have increased lending to the productive economy while locking in the profits from lower funding costs. Evidence is pointing to this second explanation. According to PBoC data, new renminbi bank loans rose to $527bn in January, the largest amount in a single month. Aggregate social financing, a broader measure that includes bank lending, shadow bank activity and capital markets, including equity fundraising, was also at an all-time high of $655bn. Further, we should not ignore three further potential tailwinds that could lift China’s performance. The first is a resolution of the US-China standoff. The US President, satisfied with progress on “important structural issues including intellectual property protection, technology transfer … [and] currency” has pushed back the March deadline for a deal to avoid tariff increases on $200bn of Chinese exports. This is good news but doesn’t completely abate the uncertainty. The second potential tailwind is the prospect of fiscal stimulus. Significant government investment helped turn around the ship in 2015, but with limits on how much more infrastructure China needs the talk today is of tax cuts. Last year, Liu Kun – the minister of finance – revealed that 2018 brought reductions in taxation of around $190bn, with a focus on personal income taxes and sales taxes. As part of an effort to stimulate and rebalance the Chinese economy, this year could see further giveaways to a wider group of beneficiaries. In January, for example, the government reduced levies on small and micro companies by $29bn a year. The third possible fillip could come from a more relaxed monetary policy. The PBoC could cut rates or direct credit into the private economy, but the central bank knows the risks are elevated. Many state-owned and private companies remain highly leveraged after the stimulus programmes that followed the 2008 and 2015 slowdown. With the PBoC keen to reduce risks to financial stability, there may be limits to how much credit stimulus the central bank can and is willing to extend to an over-leveraged economy. Without signs of any of these supportive factors, in addition to a sustained increase in sound bank lending, we believe that negative momentum from China could persist with consequences for the wider global economy – holding back the recovery of emerging markets and creating significant headwinds for the economies of the eurozone.